One thing that has struck me and so many others as a very deadly thing to our country is the growing disparity between the rich and the poor. Another is how many in the rich category seem to be uncaring and even callous to those who don’t have the luxury that they have. There is plenty more like this to be found, if you look for it. A team of researchers at the New York State Psychiatric Institute surveyed 43,000 Americans and found that, by some wide margin, the rich were more likely to shoplift than the poor. Another study, by a coalition of nonprofits called the Independent Sector, revealed that people with incomes below 25 grand give away, on average, 4.2 percent of their income, while those earning more than 150 grand a year give away only 2.7 percent. SOURCE:What wealth does to your soul – The Week. I end many of my posts with the words “but I’m just a simple guy so what do I know?” That is just my way of saying what Will Rogers said about all he know is what he reads in the newspaper. I don’t have some inside knowledge about anything I post about here. One thing I want to make sure that you understand is that there is a world of difference between being a simple guy and being simpleminded. One of the biggest insults someone could call me is simpleminded. This definition is OK as far as it goes but to me simpleminded really mean having a lazy mind and in my mind that is the biggest problem for humanity. It is the root cause of most of the problems of the world. Simple minded people don’t take the time to study something but instead just parrot what their favorite talking head tells them. Sometimes it is something that they have grown up with but never taken the time to see it is really true. Lazy minds drive me crazy. I am a simple guy in that I am just not attuned to the big luxuries in life. I tasted caviar once and hated it. I can’t see driving a $50,000 car when a $15,000 one will get me from A to B just as well. I can’t see spending $200 on a restaurant bill when most of it goes down the toilet the next day. I am just not a high brow type of guy. Never have been; never will be. One of the ugliest things to me is a smirk. One of our recent president was very good at that and maybe that is the primary reason I celebrated his last day in the White House. Smirking is where a person gives you the impression that he is superior to you. I totally believes that God loves the homeless guy as much as the CEO who gets millions of dollars in bonuses each year. He loves those 50,000 little kids in foreign countries who died last week of malnutrition just as much as any kid in the U.S. I admit that I probably have more empathy than some people. I cry regularly when I see one human being showing compassion for another. Even though I am not a Catholic I swell up with emotions when I read many of the words of the most recent Catholic Pope. I am a simple guy with a simple purpose in life. I don’t want to be famous or stinking rich. In many ways those things cause more pain than not. I thank the Lord that I have enough to eat and a healthcare plan that I can finally count on. I thank the Lord for having something as simple as good drinking water when so many other in the world don’t. I’m Just a Blue Collar Guy…..
And He Went Home One Night…. I, like so many others was saddened to see the death of Whitney Houston. She became famous just before I went deaf so I sort of remember some of her songs. She indeed had a rare talent. It sounds like from the initial reports that her death was at least partially caused by her addition to drugs and alcohol. Of course Elvis, and quite a few other rich and famous people have had a similar ending. I’m sure Whitney had an entourage of people constantly around her to grant her every desire. She was certainly rich beyond what anyone of us common folks can even imagine. Why is it that so many with so much end up with tragic deaths? This brings to mind a song by one of my most favorite groups from the 1960s which was a Simon and Garfunkel They had a song entitled Richard Cory. Even after almost fifty years I can still recite much of those lyrics about how a poor guy who is struggling just to get along couldn’t understand how Richard Cory could be so unhappy to take his own life. I recently learned that this song was actually based on a poem written in the late 1800s by Edwin Arlington Robinson. Here is his poem. The fact that Richard, Whitney, Elvis, and many others had tragic endings is an affirmation of the old say “Money does not buy happiness”. Those of us who by comparison have very little simply can’t understand how those much richer than us can be so unhappy. Source: ‘Occupy’ protesters find allies among the wealthy – US news – Life – msnbc.com. There is some very interesting stuff going on with the Wall Street Rallies lately. The latest theme of these rallies are “We are the 99%”. This draws from the fact that currently 1% of the U.S. population controls about 50% of the total wealth in the country. Due to the high umemployment at a time with correspondingly high bonuses for the super rich (1%) the people are finally starting to realize that something is wrong with the current way our capitalist system is operating. 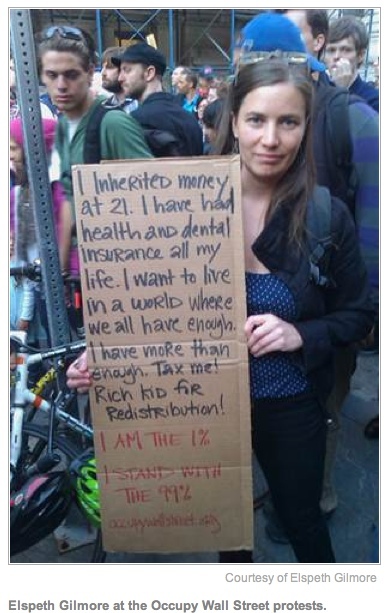 This 1% number rivals even the medieval serfdom times in the Middle Ages! And given the exodus of middle class jobs and high unemployment the serf mentality seems to also be taking hold. Getting back to the interesting thing as mentioned in the beginning of this post, it seems some of the 1%, or at least those near the 1% are joining the 99%. To the right is a picture of one of those individuals. I’m sure there are many in the “real” 1% who are screaming that “Those are just the spoiled rich kids who don’t appreciate the power that was given to them….” In some ways that is probably true but since a good percentage of the 1% got to where they are by the elimination of the inheritance taxes deemed “death taxes” by the spinners hired by the 1%. I certainly celebrate the 1% who are standing with the 99% to put more power to the people. When this condition reached its peak in the 1700s in Europe it resulted in the French Revolution. That was certainly a bloody one for the 1%. I certainly hope that doesn’t happen again but we do need to fix this total inequality before it does. So, here is to you 1%ers who have a conscience. There is a lot of talk about the federal government deficits these days. Yes, we need to get that under control. One of the ways to do that is to reign in our obnoxious military spending. We spend many many times more per citizen on our military complex than any other country in the world. As a matter of fact we spend more than the rest of the world combined!! If we reduced our spending to only ten times more per citizen than any other country we could cut more than $3 trillion dollars in ten years. Yes, I am playing the same game here as those yahoos in Washington. In order to make the number sound larger I count ten years instead of just one like normal people. I can play the same games as they do. Another way is to roll back the drastic tax cuts given to those who make more than $1 million per year that were doled out by baby Bush’s administration. That would reduce the deficit by another couple trillion. Instead we seem to want to do it on the backs of the poor. The latest spending bill decimated the Pell Grants. This is money to help those whose families earn less than $25,000 (that’s per year not ten years (ha)) go to college. It seems like we as a country would rather keep the poor in their place rather than asking the rich to hold off on that new $200,000 car for another year. The inscription on the Statue of LIberty says something like “give my your huddled masses..” Maybe we should add “and we will keep them that way”. There is a deficit that no one talks about these days and that is the U.S. trade deficit. We got good news today that the trade deficit might only be $1 trillion this year. It is usually much higher. So we send about a trillion dollars a year more of out the country than we bring back in with our sales abroad. Just where does all that money go? Shouldn’t we be just as concerned about this deficit as the federal one? But I am just a simple fellow, what do I know….